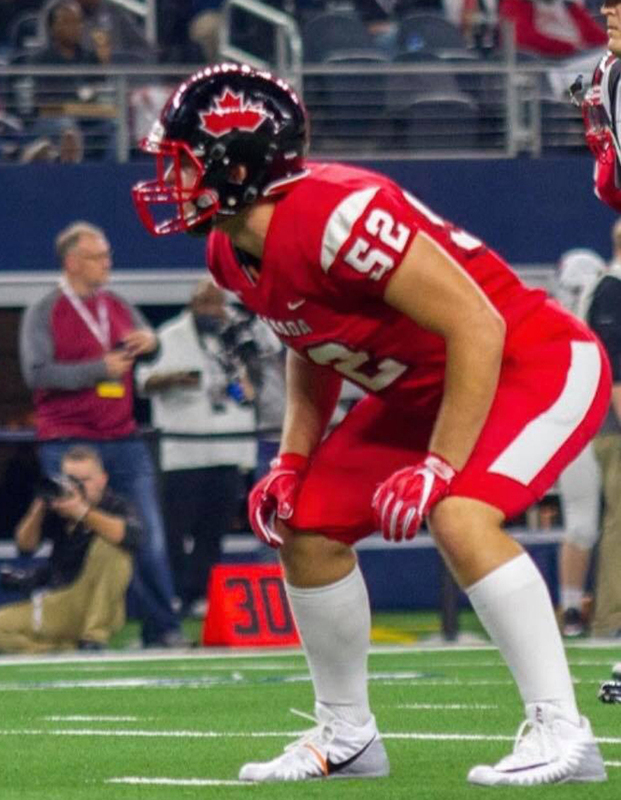 Napanee's Braden Hart took part in the u-18 International Bowl earlier this month at AT&T Stadium, home of the Dallas Cowboys. Submitted photo. 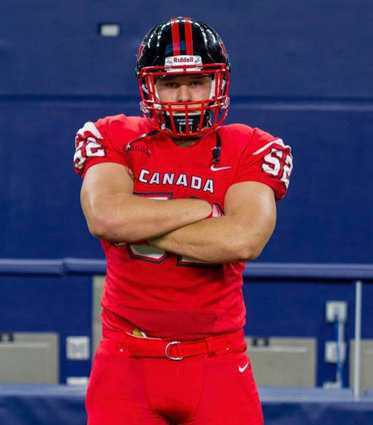 Braden Hart’s Canadian u-18 football team may not have come away with the victory in their International Bowl showdown on Jan. 19, but the Napanee native walked off the field at AT&T Stadium with plenty to smile about. Hart, a linebacker, helped hold the U.S. u-18 team to just a touchdown in the first half. Canada’s offensive wasn’t able to generate much however, as they entered halftime down 7-0, en route to a 27-10 loss. While he didn’t get the win, the experience of training with Canada’s best high school aged players and coaches was invaluable for Hart. Leading up to the bowl game he spent the week attending two meetings a day mixed in with a daily practice. The game itself was a new experience for Hart, as it was adapted to feature American high school rules. Braden Hart at linebacker with Team Canada. Submitted photo. This actually marked the second time Hart had the opportunity to play on the same field as the NFL’s Dallas Cowboys, but it was his first doing so as a member of Team Canada. He had previous represented Ontario. Hart says he’s not yet sure if the International Bowl game will be his final one before embarking on his university career with the York University Lions or if he’ll play with the Junior Gaels this summer. The NDSS Golden Hawk wrapped up his KASSAA career in October before committing to York U for this coming fall. Either way he’s already busy working on endurance drills in the hopes of hitting the ground running for his OUA career.